The websites creator or author is WebWolf Design - wwolf.net. A profile of Chilakootbowhunters.org was found on the social network Facebook. The web server used by Chilakootbowhunters.org is located in Tenafly, USA and is run by Management Software. The server runs exclusively the website Chilakootbowhunters.org. 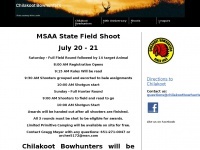 A Apache server hosts the websites of Chilakootbowhunters.org. Indexing the data of the website and following hyperlinks on it is explicitly allowed by robot information.